Good Times Flat Wraps 25/2's 50ct - flavors are Good Times White Grape Flat Wraps - Good Times Grape Flat Wraps - Good Times Sour Apple Flat Wraps - Good Times Strawberry Flat Wraps - Good Times Passion Flat Wraps - Good Times Mango Flat Wraps - Good Times Blueberry Flat Wraps - Good Times Watermelon Flat Wraps - Good Times Fruit Punch Flat Wraps - Good Times Green Flat Wraps - Good Times Natural Flat Wraps Good Times Cherry Flat Wraps - Good Times Peach Flat Wraps packed in 25/2's - 50ct. 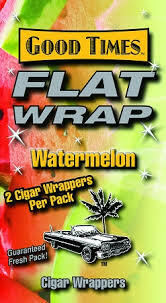 Good Times Flat Wraps Cigar Wrappers are an extremely superior flavor and always fresh wrapper. There are 25 individual Good Times Flat Wraps pouches in each unit and each pouch has two double wide wrappers, you get a total of 50 Good Times Flat Wraps for an exceptionally low price and high quality product.